For a few months now, Will Devokees has been in contact with me about a DD fan film trailer he was producing. He is interested in auditioning for the role of Matt Murdock/Daredevil in a potential DD reboot movie, and he has been hard at work with many people to make a trailer to submit to FOX. They've got about a month to go for the full trailer, but he's let me know about a teaser trailer that is now complete. Check it out! CBR's Dave Richards sat down with DAREDEVIL: REBORN writer Andy Diggle to discuss the outcome of SHADOWLAND and what it means for the new mini series that is coming in January. Plenty of spoilers ahead, with an exclusive first look of the third issue's cover! Francesco Francavilla finally revealed the missing piece from his "New Man Without Fear" teasers... here! Marvel revealed the new DAREDEVIL: REBORN logo... here! My new interview with David Liss, where we discuss all things BLACK PANTHER! Wall Street's Real Life Daredevil? Discuss what the future holds for DD on the Message Board! Please check out this new interview I've posted with SHADOWLAND: POWER MAN artist Mahmud Asrar! We talk about his collaboration with writer Fred Van Lente and the obscure villains in the series. If you've read the ending of SHADOWLAND and DAREDEVIL, you know BLACK PANTHER is taking over the numbering. I recently interviewed writer David Liss about this new series and what it means to the citizens of Hell's Kitchen. SHADOWLAND has ended... and now there's AFTER THE FALL... Click the image for a preview of the one-shot by Johnston, Checchetto, and De La Torre! SPOILERS! If you were a fan of the ELEKTRA: HAND AND DEVIL fan film, check out this new PUNISHER '81 Fan Film by Blinky Productions, featuring an appearance by Daredevil Yellow! If you've read the recent SHADOWLAND: DAUGHTERS OF THE SHADOW series, please check out my new interview with writer Jason Henderson, where we talk about the 3-part story and all things Colleen Wing. Two more SHADOWLAND tie-ins ship next week... POWER MAN #4 and BLOOD ON THE STREETS #4! As always, the SHADOWLAND HUB is updated with all previews, solicits, release dates etc.! Longtime supporter of the site, VisionComix.com has added quite a few new items to their list of books that are discounted 40-50% for ManWithoutFear.com visitors. Have a look at the deals. Just added were hardcovers of DD/ECHO, DD: YELLOW, DD: MAN WITHOUT FEAR and more! Marvel is pleased to present your first look at Daredevil #512, the landmark final issue from writer Andy Diggle and artist Roberto de la Torre! In the wake of the shocking conclusion of SHADOWLAND, Hell's Kitchen has been thrown into disarray and Matt Murdock is among the missing. Does the mantle of Daredevil now rest with a dead man? And are his friends, lovers and allies able to cope with what he wrought, let alone atone for his sins? It's the dramatic last stand of a Marvel icon as this era of Daredevil comes to a close, only in Daredevil #512. Your New Look At BLACK PANTHER: THE MAN WITHOUT FEAR #513! Marvel is pleased to present your new look at Black Panther: The Man Without Fear #513, from best-selling author David Liss and the acclaimed artist Francesco Francavilla! The smoke has cleared from the ruins of Shadowland and a new protector of Hell's Kitchen is on the prowl. His name is T'Challa, the Black Panther! In a city without Daredevil and a dangerous new foe called Vlad the Impaler consolidating power in the underworld, the Black Panther must learn to become a new type of hero. Without his riches, his technology, and his kingdom can T'Challa truly be the Man Without Fear? Find out in Black Panther: The Man Without Fear #513! DAREDEVIL #511 and SHADOWLAND: POWER MAN #3 both ship next week, and here are the previews! Here are the latest previews, as SHADOWLAND #4 and SHADOWLAND: BLOOD ON THE STREETS #3 ship next week! I recently had a chance to speak with former MARVEL KNIGHTS Vol. 2 writer John Figueroa, and we talked about the series in this new interview I've posted. Hope you guys enjoy this look back! Next week's SHADOWLAND: SPIDER-MAN is now available for preview, by Dan Slott and Paulo Siqueira! Friend of the site, Alice Lynch, who you probably know better as Darediva, is taking part in the Foundation Fighting Blindness' fundraising event VisionWalk on October 23, 2010. Please do your part in funding research by donating what you can. Alice herself was diagnosed with macular degeneration, which over time may reduce her sight considerably. She is confident that new therapies will help her and others in the future. Thank you. Marvel is pleased to present your first look at Shadowland #4, the latest jaw-dropping chapter in the sold out series from creators Andy Diggle and Billy Tan! After last issue's shocking revelation about Daredevil, the alliance of Spider-Man, Luke Cage, Iron Fist, The Punisher, and Ghost Rider now know they may be too late to stop Murdock's rise to power. But if they can't save The Man Without Fear, all of New York -- and the Marvel Universe -- will fall to a darkness unlike any it's ever seen. The final battle begins in Shadowland #4! And here's some more info on the new series, coming in December! The BLACK PANTHER news keeps coming, as a new interview with writer David Liss has been posted at CBR. An interesting quote from Liss: "This isn't a series with a finite number of issues planned. This is the new status quo for the character and this area of the Marvel Universe." Marvel Announces BLACK PANTHER: MAN WITHOUT FEAR! Marvel is pleased to announce that best-selling author David Liss and the acclaimed artist Francesco Francavilla will be launching the all-new Black Panther: The Man Without Fear this December! The smoke has cleared from the ruins of Shadowland and a new protector of Hell's Kitchen is on the prowl. His name is T'Challa, the Blank Panther! In a city without Daredevil and a dangerous knew foe called Vlad the Impaler consolidating power in the underworld, the Black Panther must learn to become a new type of hero. Without his riches, his technology, and his kingdom can T'Challa truly be the man without fear? Find out in Black Panther: The Man Without Fear #513! Shadowland Is The Comic Event Of The Summer! Marvel is pleased to announce that Shadowland #1, #2, and #3 have sold out again at Diamond, cementing the series as the number one read this summer! Readers now have the exciting opportunity to catch up on the entire series when Shadowland #4 hits shelves this month! "We're extremely happy with the success of Shadowland and I'm very proud of the work Andy, Billy and the rest of the team have done crafting the story," says editor Stephen Wacker. "From the core titles to the tie-ins, we're seeing an amazing response from readers. The book just can't stay on the shelves. I just hope we don't run out of paper." Shadowland #1, Shadowland #2, and Shadowland #3 have all sold out at Diamond and are returning with Shadowland #1 Fourth Printing Variant, Shadowland #2 Third Printing Variant, and Shadowland #3 Second Printing Variant! Readers who have missed out on the jaw-dropping first three issues of the sellout series can now catch up just in time for the release of Shadowland #4! Shadowland #1 Fourth Printing Variant and Shadowland #2 Third Printing Variant both feature the exhilarating covers of John Cassaday, while Shadowland #3 Second Printing Variant features the awe-inspiring interior artwork of series-artist Billy Tan on the cover! Due to the unprecedented success of Shadowland, Marvel urges retailers to check their orders on all upcoming issues and tie-ins as the series is poised to change the landscape of Hell's Kitchen and the Marvel Universe. The battle for the soul of New York rages on! If you enjoyed the recent DAREDEVIL: BLACK AND WHITE one-shot, be sure to check out my new interview with Jason Latour, Peter Milligan, Rick Spears, Mick Bertilorenzi, Ann Nocenti, and editor Jody LeHeup. David Aja's contribution will follow in the coming weeks. 3 more SHADOWLAND titles coming next week! Here are the latest previews! Next week's DAREDEVIL 510 and SHADOWLAND: BLOOD ON THE STREETS #2 are both available for preview! SPOILERS! The Unusual Suspects feature continues at CBR this week, with Ghost Rider, Colleen Wing and Moon Knight in the spotlight! Your First Look At Shadowland: Power Man #2! Marvel is pleased to announce your first look at Shadowland: Power Man #2, from red hot writer Fred Van Lente and up-and-coming artist Mahmud Asrar! Who is this new Power Man and how can he defeat both Luke Cage and Iron Fist? This newfound vigilante problem on the streets of Shadowland is worsened when the villains from Luke Cage and Iron Fist's past show up to take the heroes down! The battle for the soul of New York continues in Shadowland: Power Man #2! And for fans who missed out on the first issue of this electrifying series, Shadowland: Power Man #1 Second Printing Variant hits store shelves this September! Fan Expo 2010 in Toronto has come and gone, and I was able to go downtown on Sunday. After hearing about the crowd problems on Saturday (where Marvel announced some titles, see news from 28/08), I was hesitant to try Sunday. My sister wanted to come along to see some of the Sci-Fi actors who were there. So we met up, headed downtown and reached the convention centre at 11:40AM. The lineup was already out the door and down the street, almost the length of the convention centre itself. I had told my sister that if the line was too long, we'd head back home. But suddenly, the line started moving fast. The organizers were moving people in blocks, to keep the crowd under control. We finally got around the convention centre, up the ramp towards the CN Tower. The sun was blazing. We were sweating like crazy. The doors were ahead. We thought when we were allowed to get through them, we would buy our tickets. And we were wrong. There was an equally long line inside, wrapping like a snake in a queue. And it wasn't single file... everyone was just rammed together, so people who were behind us were now ahead of us, etc. After our little break, we made our way to the back, where the artists were. We passed by the Marvel booth, because I wanted to see if editor Stephen Wacker was there. No luck. So, we headed to the back, looking for Paul Azaceta and Paolo Rivera. We found Paul Azaceta first, but he was doing an interview. So I patiently waited and got him to sign an issue of DAREDEVIL. I then found Paolo Rivera, and asked him to sign two covers he did. He said "Oh, you're the first person to bring DAREDEVIL to sign." I meekly said he was my favourite character and I run a DD web site. He asked what it was called. I said manwithoutfear.com and he said "Oh, cool, I've been there. You sent lots of traffic my way to my blog. Thanks!" I asked him if Marvel would make any posters of his covers, but he didn't know. I told him his covers were very popular with DD fans. Afterwards, we made our way back to the Marvel booth. I was feeling pretty tired by this point. I saw that Agent_M himself was there, so I nervously asked if he was who I thought he was. We chatted for a bit about the announcements from the day before. He had some images that he hadn't uploaded, but he didn't have them on his computer to show me! Then I noticed Stephen Wacker was there too, so I headed over to talk to him. Introducing myself at these shows is always nerve-wracking for me, because, first of all, I'm not some egomaniac who thinks these guys even know who I am. I'm just some guy who runs a site. I said my name to him, and he didn't recognize me. So then I said "Daredevil site" and then he knew. We chatted about the announcements. He asked me if i was okay (I was feeling very tired after the waiting in line and now I was pretty nervous too). Then he said there was a guy dressed as Matt Murdock who was a "Shadowland" version with red eyes. He looked around and the guy was still in the Marvel booth. He called the guy over, and he introduced me to "Matt Murdock". The guy said his name was Matt (it really was!). When the guy heard who was in front of him... oh boy. I'm sure Stephen Wacker will never forget this, but Matt Murdock started saying "Oh my god, I've wanted to talk to you forever! I'm so happy to meet you. I've wanted to apologize to you and I hope you're not upset with me." Turns out, Matt Murdock was one of the guys who had planned a DD movie many, many years ago and had been sending me updates about the project. Matt explained to me that one of his friends had been sending emails posing as him and had been lying to me about it! So he wanted to apologize for that. I told him many people did not believe they were really working on a movie, but he said he really did have a script. We talked a bit more about Bendis and Brubaker's runs. Nice guy. I remembered that I had brought a Condorman novel with me to show Stephen Wacker, so he got a kick out of that. We did discuss the SHADOWLAND: AFTER THE FALL one-shot (where he told me Antony Johnston was writing it) and DD: REBORN is 4 issues... And I told him many people were upset with the changes going on... And he knew that, but he said "you just tell everyone we are fans of DD and the stuff coming up is really good." I didn't press him about anything following REBORN. It's not like he was gonna tell me anyway. He had to go to something at the booth, so we shook hands and I left for the day. He thanked me again for my support of DD. As I first reported on Twitter as the news broke... At today's Fan Expo in Toronto, it was announced that there will be a 4-issue limited series entitled DAREDEVIL REBORN, coming in January, by Andy Diggle and Davide Gianfelice, with covers by Jock! Also, the fallout from SHADOWLAND will be called "SHADOWLAND: AFTER THE FALL", that is coming in December, with a cover by David Finch. If you'd like a quick look at the covers/promos, check out here and here! Here's the report from CBR! More details coming soon... as the promos will be released shortly. UPDATE: Jock has posted the cover on Twitter, so here it is! Marvel is pleased to present your new look at Thunderbolts #148, from red hot writer Jeff Parker and rising star artist Declan Shalvey! The Thunderbolts enter the realm of Shadowland! Luke Cage heads into Shadowland to quell his old friend Daredevil.s madness. When things get too out of hand, Cage calls in the Thunderbolts. But will this squad of super-powered ex-cons save the day or revert to their old ways? Find out in Thunderbolts #148! Here are more previews, of SHADOWLAND #3 and SHADOWLAND: ELEKTRA #1! Daredevil Continues Shadowland's Non-stop Sell-Outs! The blockbuster hit of the summer, Shadowland, continues as Marvel is pleased to announce that Daredevil #509 has sold out at Diamond (though copies may still be available at a retail level) and will return with Daredevil #509 Second Printing Variant! From the red hot creative team of Andy Diggle, Antony Johnston and Roberto De La Torre, a new world order has taken over Hell's Kitchen as Daredevil's Shadowland stronghold continues to grow! Matt Murdock's former friends and allies are trying desperately to bring The Man Without Fear back to his senses, but can anyone put an end to Daredevil's reign of terror? Don't miss Daredevil #509 Second Printing Variant; your new chance to get a look at this blockbuster event that will change Daredevil and the Marvel Universe forever! I should never be surprised by the reactions [of] our audience at this point, and yet time and again, week in and week out, they surprise me. We've been promoting "Who is the new Man Without Fear?" for something like three weeks now, and yet everybody is surprised that "Daredevil" is ending. One pretty clearly follows the other, so I was sort of taken aback by the response to the solicits being, "Oh my gosh! 'Daredevil' is ending!" What did you expect was going to happen when we asked who the new Man Without Fear would be? 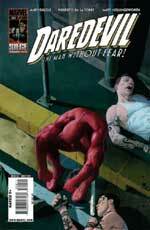 More at CBR, along with some exclusive pages from DAREDEVIL #510 by Marco Checchetto! Marvel is proud to present your first look at Shadowland: Blood On The Streets #2 (of 4) from the red-hot creative team of writer Antony Johnston and artist Wellinton Alves! Continuing the run-away smash hit of the summer, Shadowland, a rogue faction of The Hand is mysteriously killing off mobsters untouchable by the law and it's up to the unlikely team of Silver Sable, Paladin, Misty Knight and The Shroud to find out if they're working for Daredevil! Will this twisted murder mystery unite the quartet, or place them in each other's crosshairs? Can this controversial crew put aside their differences before a war between The Hand and the mob sets New York ablaze? Find out in Shadowland: Blood On The Streets #2 (of 4)! Fans and critics agree, Shadowland: Blood On The Streets is a hit! Plus, don't miss Shadowland: Blood On The Streets #1 Second Printing Variant; your new chance to get in on the ground floor of this pulse-pounding action packed series! Be sure to check out all the recent previews of SHADOWLAND: POWER MAN #1 and SHADOWLAND: DAUGHTERS OF THE SHADOW #1 as well! Your First Look At SHADOWLAND: GHOST RIDER #1! Marvel is pleased to present your first look at Shadowland: Ghost Rider #1 from rising-star writer Rob Williams and superstar artist Clayton Crain! The red-hot comic blockbuster of the summer, Shadowland, continues as the Spirit of Vengeance makes his debut after being summoned by the Kingpin. In an attempt to change the tides of war, Ghost Rider must travel to Japan and take on the unrelenting might of the secret ninja organization known as The Hand. Can Ghost Rider storm into the belly of the beast and make it out in one piece? Find out in Shadowland: Ghost Rider #1! In today's November solicits that I've posted, you'll notice that a certain long-running Marvel title has its final issue in November. I won't discuss any story elements here, since the solicits are still spoiler-filled... but Daredevil will end with issue #512. Of course, this doesn't mean THE END... DD will return... trust me. You can also discuss this on the very popular Message Board, where hundreds of DD fans visit every day! Well, not really, but it sounds impressive. Page from SHADOWLAND: ELEKTRA #1! Marvel is pleased to announce that both Shadowland #2 and Shadowland: Bullseye #1 have sold out at Diamond (although copies may still be available at a retail level) and will be returning with Shadowland #2 Second Printing Variant and Shadowland: Bullseye #1 Second Printing Variant. Fans can't get enough of the biggest summer comics event of the year and this second straight sell-out is proof! Darkness has shrouded Hell's Kitchen and everything you thought you knew about Daredevil is about to change! First in Shadowland #2 Second Printing Variant, from the superstar team of Andy Diggle and Billy Tan, the battle for the soul of New York continues and it's up to Luke Cage, Iron Fist, Spider-Man and Moon Knight to ensure the neighborhood's survival. With each issue raising the stakes, there's no telling who will make it out of Shadowland alive! Then, in Shadowland: Bullseye #1 Second Printing Variant, the secrets of the world's most deadliest assassin are finally revealed! 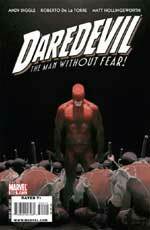 For years he's haunted Daredevil's life, violently striking the Man Without Fear in the places that hurt like hell. Now, with his life as an Avenger behind him, find out the true story behind Bullseye's past. Marvel urges retailers to check their orders on Shadowland and all its tie-ins as each issue continues to sell out in record times! Who will be the dangerous new player that could tip the scales? Will the Kingpin be the savior of Hell's Kitchen? Find out the answers to these questions and more in Shadowland #2 Second Printing Variant and Shadowland: Bullseye #1 Second Printing Variant! Another day, another teaser... this one was released only with the words "The End" on a pic with DD's 4 costumes set ablaze... and the date "November 2010". So is it teasing the end of SHADOWLAND, or DD: END OF DAYS? Who will be the new Man Without Fear? Shadowland brings a major change to the Marvel Universe! If you put all the teasers together, there's a space missing... what can that mean? DAREDEVIL 509 ships next week and here's a preview, by Andy Diggle, Antony Johnston, and Roberto De La Torre! SHADOWLAND: BLOOD ON THE STREETS #1 ships next week, and here's the preview! Two updates in a day from from Marvel... now featuring Falcon. And another teaser from Marvel... featuring Black Panther. As expected, here's the next teaser from Marvel... featuring Gambit. Looks like the teasers for the "new Man Without Fear" that I mentioned during Comic-Con are now being officially released. Check out the one for Nova... expect the teasers for Kraven, Falcon, Gambit etc. to follow... and notice how they will be connected to form one image. As I mentioned before, my theory is that this is a teaser for a What If? event that will follow SHADOWLAND. The Unusual Suspects feature at CBR continues, this time with Power Man. There are profiles on Luke Cage, Iron Fist, the new Power Man, and Shang Chi! Learn more about Bullseye in the new one-shot SHADOWLAND: BULLSEYE! 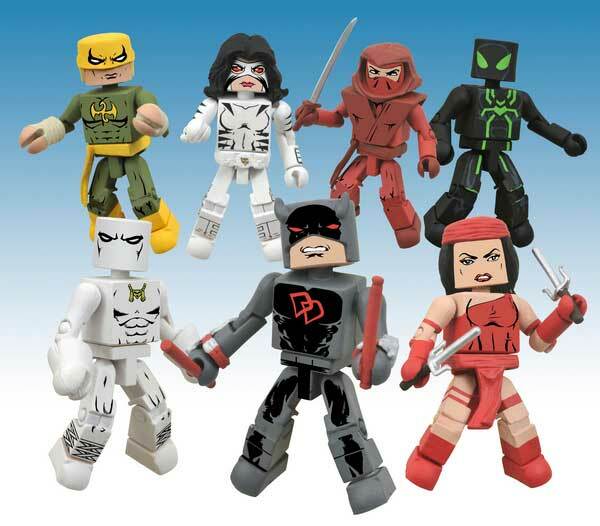 DAREDEVIL: BLACK AND WHITE ships next week, and here's the great preview! Here's a preview (lettered) of SHADOWLAND #2, which ships next week! There are two covers (so far), by Andy Diggle & Billy Tan! Newsarama has an advance preview (lettered) of SHADOWLAND: DAUGHTERS OF THE SHADOW #1, which ships in August, by Jason Henderson & Ivan Rodriguez! Here's an advance preview of SHADOWLAND: POWER MAN #1, by Fred Van Lente and Mahmud Asrar! My guess is that this is a "What If?" event, not what Marvel is trying to lead us to believe. The Unusual Suspects feature continues on CBR, and this week it's on the mini SHADOWLAND: BLOOD ON THE STREETS. There are profiles of Silver Sable, Misty Knight, Paladin and Shroud! Both SHADOWLAND #1 and DAREDEVIL #508 are going back for new printings! Due to extraordinary demand, Shadowland #1 Second Printing Variant has sold out of its entire print run before copies even shipped to retailers. Marvel is determined to keep this book in stock and Shadowland #1 is going back to press yet again and will return with Shadowland #1 Third Printing Variant! There's a battle for the soul of New York and Marvel's newest villain makes his gut-wrenching debut. Now with an all-new cover from fan-favorite artist Ben Oliver, the Shadowland #1 Third Printing Variant is a must own! 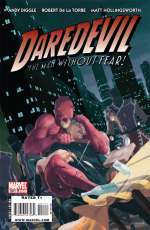 Marvel is also pleased to announce that Daredevil #508 has also sold out at Diamond and will return with Daredevil #508 Second Printing Variant! "It's great to see this corner of the Marvel U getting so much attention. We hasn't seen this much reorder activity since Marvel Zombies!" adds David Gabriel, Marvel Senior Vice President of Publishing, Sales and Circulation. "The orders for the second printing came in much higher than we expected, and the sales on Daredevil also far exceeded our overprinting. It's similar to what we just experienced with X-Men: Second Coming where the excitement and demand grew month after month." Don't miss these upcoming issues. Marvel urges retailers to check their orders on these books as the series is poised to change the landscape of Hell's Kitchen and the Marvel Universe! *Note: Retailers should get their orders in as early as possible for Shadowland #1 Third Printing Variant as this will be printed before the Final Order Cutoff date. See next week's Marvel Mailer for ordering information. Two weeks ago we saw the Daredevil costume from LittleBIGPlanet... now here's a look at Elektra! The SHADOWLAND news keeps on coming, as we now get a sneak peek at the SHADOWLAND: DAUGHTERS OF THE SHADOW debut issue by Jason Henderson and Ivan Rodriguez! SHADOWLAND #1 was on sale today in Canada, but the rest of the world gets it tomorrow... but that didn't stop Diamond and Marvel from revealing that the debut issue has already sold out! Two new covers for a 2nd printing will be available on July 28th, so get your orders in by the 15th at your store. Media Release -- After an immediate sellout at Diamond, Marvel is pleased to announce that Shadowland #1, by the red-hot creative team of Andy Diggle and Billy Tan, will return with two second printing variants! Featuring the stunning interior art of artist Billy Tan on the covers, Shadowland #1 Second Printing Bullseye Assault Variant showcases the shocking cliffhanger ending to Shadowland #1, while the Shadowland #1 Second Printing New Costume Variant exhibits the all-new Daredevil costume. With Shadowland #1 hitting shelves everywhere tomorrow, fans should get to their stores early to secure a copy before they're all gone! With the unprecedented success of Shadowland #1, fans can't miss these upcoming Shadowland tie-ins! Marvel urges retailers to check their orders on Shadowland and it's tie-ins as the series is poised to change the landscape of Hell's Kitchen and the Marvel Universe! Prepare yourselves for the birth of Marvel's newest villain as the battle for the soul of New York rages on! *Note: the New SHADOWLAND #1 SECOND PRINTING NEW COSTUME VARIANT will be printed in fewer quantities. Also, retailers should get their orders in as early as possible as these sec printings will be printed before the Final Order Cutoff date. If you've checked out the preview for SHADOWLAND #1, you'll have noticed that in addition to the variant we already knew about, there's a black and white cover variant as well. It's not listed on any shipping list and didn't appear in the original solicits. I asked Marvel for some info on it and they let me know that it's a special Marvel Retailer Resource Center exclusive variant. Retailers who are subscribed to this service through Marvel will get copies of this variant shipped to them in August. So, if you really want this cover, it's going to be difficult to obtain... expect to pay quite a bit for it. Marvel has posted the Daredevil costume that will be available for download for LittleBigPlanet! Editor Stephen Wacker posted another preview on Twitter today, this time it's a page from Shadowland: Bullseye by Sean Chen! Be sure to visit your comic shop this week, just in case they've ordered a free SHADOWLAND double-sided promo poster. One side has the Spidey/Punisher teaser image, and the other has the Wolverine teaser with Bullseye's mask. It's 2 feet by 3 feet and is shipped rolled. Also, if you've ordered the SHADOWLAND variant cover, it's going to be a 1:10 ratio. If you're never read the Bendis/Maleev run on Daredevil, now's your chance to start. 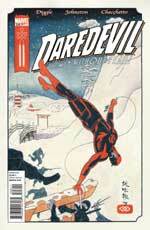 Today marvel is releasing a reprint of Daredevil #26 for $1 under its Marvel's Greatest Comics initiative. Once you're done, you can read the next issue for free on Marvel.com! If you need help on collections of the material, please give me a shout! No, I'm not talking about all the tie-ins, I'm talking about a special promotion Marvel is doing for SHADOWLAND. Check out these details at Bleeding Cool. That's quite the assurance from Marvel that they want this to do well! Retailers can get an almost 80% discount. Editor Stephen Wacker posted a pic from Daredevil 509 on Twitter today... have a look at this uncoloured page by Roberto De La Torre! A non-dialogue preview of DAREDEVIL #508 has been released today... check out Roberto De La Torre's version of the new DD costume! Marvel is proud to present your first look at Daredevil #508, a vital chapter in the Marvel Universe-shifting epic known as Shadowland! Red-hot writers Andy Diggle and Antony Johnston, along with red hot artist Roberto De La Torre, prepare the Marvel Universe for the birth of its greatest villain yet. The long time judge and jury to the criminals of Hell.s Kitchen has just become their executioner! But just who will step in to save them? The answer will rock your world in Daredevil #508! Continuing from Dark Reign: The List - Daredevil #1, Daredevil #501 is the first issue by the new team of Andy Diggle and Roberto De Le Torre. Daredevil sits atop a church, listening to a priest at the memorial service for the 107 people killed by Bullseye in the previously mentioned Dark Reign: The List one shot. Daredevil believes all the deaths were his fault, as he stood by and let it happen when he had an army at his command who could have stopped it. Master Izo drops by, not wanting to really hear all the guilt-talk from DD. When you have lived as long as I have, Izo says, you learn the world keeps on spinning, even after your mistakes. Daredevil asks if one sacrifice could make things right... one life to save many... Izo tells DD throwing himself off the roof won't bring Bullseye's victims back. But Daredevil suddenly reveals that he wasn't talking about himself... The Hand need a sacrifice as part of their initiation... and Izo is that sacrifice. A horde of Hand ninjas, dressed in their new uniforms, attacks Izo. Izo battles valiantly, but is overcome and taken prisoner. Later, at an disclosed office in midtown Manhatten, Turk meets with the Kingpin. The Kingpin tells Turk that he is not needed as lieutenant anymore, and Lady Bullseye sneaks up behind Turk to place a sword on his throat. Kingpin tells Turk he knows about the betrayal when he told Daredevil where the Owl's hostage (Dakota) was in issue #500. Because of Turk, the Kingpin does not have The Hand at his control. Turk tells him to make his death quick. Instead, Kingpin tells Turk he will give him mercy. Lady Bullseye is surprised as well. Turk quickly runs out of the office. Kingpin calms Lady Bullseye down by telling her sometimes a more effective attack is not one that is overt. Let his enemies think he is not worthy of attention. Maybe they can trick his enemies into destroying each other. Beneath New York, Daredevil and The Hand have Izo chained up. Izo declares how lousy of a judge of character he was... he had told Stick that Matt and someone else were the only two adepts capable of taking down The Hand. They argue back and forth, with DD saying The Hand is a cave where he must stay... because in tha cave he has no friends that can be harmed. Hell's Kitchen answers to me, he says. The Hand initiation demands a sacrifice... and DD punches Izo right in the chest so hard, that Izo goes flying across the room, breaking his shackles in the process. Against a wall, Izo is declared dead by one of The Hand high priests. It is done. The Hand bows before their new leader... Lord Daredevil. At an underground clinic in Harlem, Leland Owlsley -- The Owl -- is paralyzed in his bed. The nurse caring for him is trying to convince the Owl that he needs to eat. The clinic is run by Doc Parker, who appeared in Ed Brubaker's run (#103). Several of the Owl's Lieutenants enter the room and tell the nurse to scram. With the Owl out of commission, the 3 Lieutenants tell him that they are taking over. Owl suspects that someone put them up to this. Dennison, one of the men, wanted to tell Owl to "...your face, out of respect, like... but respect only goes so far, y'know?". He places a rat on the Owl's face and says "From here on out, you're on your own." In a separate room, Izo's body is on a bed. Matt reveals that Izo can control his heartbeat, enough to fool the others. BT uses his healing powers on Izo, and the old Master rises from his coma. Matt tells Izo to get out of the lair quietly, or else the whole charade will be over. They are going to work to destroy the Hand from the inside... but Matt doesn't know how he's going to do it. Elsewhere, at the New York County Criminal Court, Foggy and Becky are awaiting the verdict on a case involving police officers. The judge has received the verdict from the jury (not guilty), but he soon overrules the verdict and declares the defendants guilty as charged. Foggy is out of his mind with rage. He accuses the judge of being a Norman Osborn cronie, like Judge Walden was (see The List). Foggy is led away by court officers as he's charged with Contempt of Court. In midtown, the Kingpin meets with the Owl's former Lieutenants. They wonder why they didn't just kill Owl, but Kingpin has a plan for him. Dennison wonders why he should be working for Kingpin now and demands to run his own empire. Lady Bullseye appears from the shadows and chops off his head. At the Oscorp Cargo Dock, a drug shipment is exchanging hands, when the NYPD show up to make some arrests. But then it seems that the police themselves are in on it and are about to kill one of the mob buyers, to make it seem like the cops did a great job. Before the cop can pull the trigger, his hand and wrist fall to the ground, severed from his arm. Daredevil, BT, WT and The Hand descend on the area. Daredevil says "Take them all." Continuing from last issue, Daredevil, Black Tarantula, White Tiger and The Hand all descend on the Oscorp Cargo Dock and subdue the corrupt SWAT and policemen. BT explains to DD how Norman Osborn's fingers are all over this drug deal. DD tells White Tiger to dump the one million dollars worth of heroin into the river. One of the Hand ninjas has a sword to a policeman's throat. White Tiger checks on the cop who had his hand chopped off last issue. He needs medical attention fast. The cops plead for their lives. The ninja waits for the kill order from DD... WT asks DD "You chose this path. The question is how far are you willing to take it?" At the law offices of Nelson, Murdock and Blake, Foggy dumps a pile of appeal case files onto Becky's desk. With Foggy disbarred (see last issue), Becky is working on an appeal. Dakota shows up and hears the news. Becky says since she is the only one running the firm, she won't be able to afford Dakota's PI services. Dakota checks some mail and is shocked to learn her PI licence has been revoked. The three know something fishy is going on... first Matt, then Foggy and now Dakota. Back at the Oscorp Cargo Dock, Detective Kurtz goes over the crimescene with a CSI. They determine that there were police issue bullets used, but no return fire. There's bloodstains from 15 different people. But no bodies. It doesn't make sense, Kurtz thinks... why would a dozen cops up and disappear in the middle of a drug bust? Later, in Manhatten, a bus full of cons is supposed to be headed to Ryker's Island. But the cops in charge stop the bus and order the cons to get out. One of the cops meets with two men named Mosley and Todd. The cop tells the men to make his "injuries" not too severe. But Mosley and Todd have other plans and double-cross the other cop and kill him. The cons want to know what is going on. They are told that The Hood has arranged their early release and they are now indebted to him -- by staying in NYC and handing over half of whatever they earn on the streets. Later, Mosley and Todd pay a visit to the Kingpin, only to find KP disposing of several former henchmen of the Owl, who disagreed with the new arrangement. The men tell KP that the bus full of cons work for them now... but they are wondering why half the men think they work for the Owl and the other half think they work for the Hood. KP tells the men they should never, ever question him again. The men leave in a hurry. Lady Bullseye comes out of the shadows and asks KP the same question. KP wants to know why Norman Osborn is allowing the Hood to operate with impunity. Back at the inner sanctum of The Hand, DD is addressing his ninja. If the cops will not be trusted, then The Hand should be the force in charge. The Hand will take back the streets. But, DD says there must be boundaries. He calls the ninja who sliced off the cop's hand. DD says that line must not be crossed. In shame, the ninja impales himself on his sword before DD can stop him. DD says to White Tiger that this isn't what he wanted. She replies that "you joined a league of assassins, what did you expect?" She ominously says "And if you think things are ugly now... how much worse do you think they're going to get?" Daredevil sits in his underground Hand lair, and one of his architects presents some blueprints to him. The site in Hell's Kitchen from "Dark Reign: The List - Daredevil" has been purchased and all permits have been acquired. DD wants this site, "Shadowland", to be built within 3 months. The architect expresses his shock at the timeline, but will use the resources at his disposal to get the job done. Black Tarantula enters the room as the architect leaves. He says it's too bad about DD's friends. DD doesn't know what he's talking about. BT is surprised that DD doesn't know about Foggy getting disbarred and Dakota losing her license. DD tells BT to gather all the men. They are going into action tonight against Norman Osborn. At NYPD's Precinct House 18, Detective Alex Kurtz and Officer Lowrie are visited by one the Hand ninjas. The ninja tells them that the precinct is in Hand territory and it should be abandoned. If not, it will be considered an act of war. Lowrie is about to draw his gun, but he is knocked unconscious. Kurtz says aloud "I think we got ourselves a ninja problem". Meanwhile, at the Excelsior Hotel, Foggy and Dakota are on a mission to blackmail Judge Kramer. They bang on a door and find the judge with a young girl. The girl leaves while Dakota and Foggy ask who is behind his recent actions (getting Foggy disbarred and having Dakota lose her license). They ask if it's Osborn. The judge puts his head in his hands... no, it's not Osborn. It's Wilson Fisk. Dakota and Foggy need to find Matt, right away. The next morning, Dakota and Foggy find one of the HAMMER troops in the war zone. They ask him where everyone is... HAMMER, the police etc. He says The Hand dragged them away. It was horrible as they were dragged away screaming. Dakota wonders aloud what has become of Matt. In the underground Hand lair, White Tiger asks DD if it was worth it... HAMMER will come down harder on them. DD says they'll be ready once Shadowland is complete. Black Tarantula says there's no way it will be built in time. DD says it better be. BT will be in charge while DD is away. He is going to Japan to attend to Hand business, and he's taking White Tiger with him. She asks what to do with their "guests". DD says to keep them on rations. It is then revealed that DD is keeping HAMMER and police captive in cages in the lair. He is not worried that they will run out of room to keep all the prisoners. Once Shadowland is complete, there will be a bigger prison. In a private jet over the Pacific Ocean, Matt and Angela Del Toro are on their way to meet with the Hand at a summit in Japan. Angela doesn't see the point of the summit. If there are people who oppose Matt, they should be cast out. But Matt says he needs all five Daimyo's (regional warriors) support before he can execute his plan. Angela is now Daimyo of North America. Matt needs her support, but Angela wonders if it's the right choice. Makoto (Eurasia), Takashi (Japan), Yutaka (Africa)... three Daimyo of the Hand are practising their archery. They are interrupted by a gunshot which destroys the target. Bakuto (South America) announces himself. He is younger than the other three. Bakuto is not happy that Matt is now in charge. He is warned that he must abide by the unanimous Daimyo decision. He is told his old sensei, Izanagi, understood the importance of this. Bakuto reminds them that Izanagi is dead... and they are no longer unanimous. Yutaka and Bakuto are about to draw weapons when they are interrupted by Matt and Angela. All the Daimyo kneel before Matt, except for Bakuto. Matt gathers all the men and tells them that he knows many of them don't trust him. But he doesn't care. He is their Shogun and they must obey. He hopes in time he can show he's worthy of their respect. Bakuto interrupts the speech and lets Matt know they need a leader who is uncompromised. Angela mutters that she knows who he's thinking of. Bakuto and Angela almost start fighting when they are stopped by Matt. He tells Bakuto that he can air his grievances at the summit tomorrow. Now it is time for rest. LATER. SOMEWHERE BENEATH JIGOKU-CHU CASTLE. Sitting around a pit (like one Elektra once had to endure), the three Daimyo discuss the night's events. Yukata mentions that the second adept is appointed. But now they have a new problem... namely Bakuto. Bakuto is rolling dice and is having lots of good luck. Later, with some of his men in his limo, he tells them that he needs to show the other Daimyo the error of their ways. He also tells how he killed his old sensei Izanagi. He didn't even give Izanagi the honour of killing himself with seppuku. He shot him in the face. Back at the castle, the three Daimyo realize their years of planning might be undone by Bakuto. They need to act tonight. They say Murdock is blind to his true role in this... and to the real power behind the Hand. He may yet turn Bakuto. If not... they will kill him. The next day, at the summit, Matt tells the Daimyo that The Hand has not changed with the times... that is why they reached out to him. They have degenerated into a gang of common killers-for-hire. He offers them a purpose, a way to bring justice. With their resources they can effect real change in the world, with their contacts in high positions. Bakuto says he is betraying every one of The Hand's ideals. Matt tells him he should think twice about accusing his Shogun of betrayal. He killed Master Izo... his friend... to prove his loyalty. Bakuto also is not quite impressed that a woman is a Daimyo. Matt tells him that they once appointed Elektra to lead them. The Daimyo say they have learned from their mistakes. Matt says they should retire and meet again after the banquet. The Daimyo are eating, but Bakuto is eating way too fast for the other's liking. He wants to be away from the corruption, he says. Suddenly, Bakuto starts seeing demons... and is taken away to his quarters. Angela and Matt don't know what has happened. Matt can't smell any poison (or bad sushi). Matt says he needs to get Bakuto to trust him. Later, Matt, in costume, sneaks to Bakuto's room. He tells him that he has come unseen. Matt senses that Bakuto's heart is beating like a jackhammer. Bakuto is still seeing demons. Matt realizes some magic must be at play. Bakuto swings his sword and chops an arm of a member of the Hand. Matt turns to realize the room is now full of Hand soldiers, with their swords at the ready. Continuing from last issue, Bakuto is under the influence of magic and is seeing visions of DD as a demon, as the Hand ninja attack. While DD tries to convince Bakuto that he isn't behind the attack, several ninja are dispatched. Sensing their defeat, a ninja throws a flash bomb. DD chases after one of the ninjas while Bakuto waits. A ninja emerges from the shadows and places a sword on Bakuto's neck. Daredevil chases down the ninja outside and subdues him. He asks who is behind this attack. The Hand ninja says "Those who walk... the Left Hand Path. From Shadow we came, and to shadow we return." The ninja then dissolves. Back at Bakuto's room, he defends himself, but quickly is on the ground awaiting a deathstroke. Daredevil returns and saves Bakuto with a well thrown billy club. The ninja dissolves. Bakuto is not convinced that DD is not behind the attacks and is just pretending to save his life to gain his trust. Later, DD and White Tiger walk the halls. DD wants WT to be in charge of security for Bakuto as all his men have been killed. All the Daimyo have been called to the Great Hall. DD knows it's an inside job but can't let the events destroy his work so far... the Hand has to be united. The discussion turns to magic, where DD talks about the "Left Hand Path"... the ancient quest to achieve divinity through black magic. Later, in the Great Hall, Matt tries to get a confession from one of the Daimyos, and then all will be forgiven. Bakuto gets up from the table, seething at the discussion. Matt listens for any changes in the heartrates of the men, but none is acting guilty (or are hiding it well). Outside, Bakuto tells one of his men that Matt is behind the attack and is perplexed that none of the others realize this. He says that Matt will learn that he is not the only one with "hidden blades at his command". Later that night, Matt is in bed and is groggy. He realizes he can smell Elektra's scent in the room. "Elektra" tells him that something inside him needs to be cut out. She stabs him with a sai. Matt awakes with a startle, only to find out he is bleeding. Was it really a dream? Underground, all the Daimyos (except Bakuto, of course) are secretly meeting again. They are unhappy with the turn of events... a different approach is needed. They need to focus on Matt's sense of decency to manipulate him. Another hooded figure enters, saying that Matt just needs to be wound up and pointed in the right direction... but why has he been chosen to lead them? The mysterious person is told to not question... only to carry out the mission. The hooded figure is asked... "Does he begin to suspect?" The hood is pulled down... "Suspect me? Hell, no. As far as Matt's concerned... I'm as pure as the driven snow." The Hand Daimyo conspiring against Daredevil are watching the hero's movements through Makoto's "third eye" abilities. DD is outside on a rooftop, brooding. But he quickly has company, as Bakuto's men attack. The Daimyo wonder if they should intervene, but decide that if DD can't defeat a ninja-kill team then he's not the man they thought he was, and their years of careful planing will be for naught. Daredevil continues to battle Bakuto's ninja team. The Daimyo wonder if they can trust White Tiger... they reveal that without Black Tarantula's healing factor, her Hand conditioning reasserts itself. And they also reveal that it was White Tiger who planted the seed of Shadowland in Matt Murdock's mind. DD is outnumbered but is disposing of many of the ninja. The Daimyo wonder how Murdock will react to Bakuto's death... will he believe he know has total control of The Hand? DD battles the last ninja and tries to save him from falling to his death. He demands to know if it's Bakuto or one of the other Daimyo who is behind the attack. The ninja cuts the line holding him, without answering. White Tiger gets the better of Bakuto and stabs him in his stomach, making it appear that Bakuto has performed Seppuku (ritual suicide). White Tiger walks outside the chamber and DD comes smashing his way through a windor. She pretends that she has been looking for him. He says that he was attacked by ninja carrying Kusarigama, Bakuto's signature weapon. White Tiger directs DD to Bakuto's chamber, lying that she found Bakuto "like this". She says that after Bakuto saw his attack on DD had failed, he didn't see any other way out. The other Daimyo appear, demanding to know what has happened. DD reveals the plot against him, but he thinks the way it has played out is a little too neat. White Tiger convinces DD that his planned outcome has occured... the unification of The Hand. He wonders if cold blooded murder is the answer. She says that The Hand is full of murderers and that's why DD joined them, to turn them away from this path. It's decision time, she tells DD. "You decide how this plays out. You." After a few moments, DD decides that she's right and they've got what they came for. They can go home. DD and White Tiger are leaving on their jet. The Daimyo reveal everything is going according to plan... Matt Murdock thinks himself to be in control. Matt tells White Tiger that he is appointing Black Tarantula as South America Daimyo. WT says "I'm sure he'll be... thrilled." "And so Murdock returns to set his destiny in motion, and with it, the fate of all mankind. In Shadowland, the tree of our ambition shall bear bitter fruit, and Snakeroot shall reign supreme." Picked up a curious back issue on the weekend called "Marvel: Portraits of a Universe" from 1994, and in issue #3 were some cool pin-ups that I had never seen before. These are recreations of pivotal moments in the Marvel Universe. The September solicits are now up on the site, and there are 9 SHADOWLAND-related issues, in addition to other DD-related titles. There's a new premiere edition hardcover of the Echo: Vision Quest arc, and the second Daredevil by Bendis/Maleev Ultimate Collection. Black Widow debuts the new creative team and lots more. If you've read DAREDEVIL 507 and are still unclear about the last page, have a quick read of this brief info blurb I wrote for it. Thank you to the many of you who have joined the board recently! Also, please check out the SHADOWLAND hub, which keeps you up-to-date on everything SHADOWLAND. Less than a month to go! If you haven't read the recent issues, also be sure to read the SUMMARIES of issues #501-507. Marvel has released a new SHADOWLAND teaser, this time with DD. Has our hero become the greatest Marvel villain? Of course, the Daredevil 507 Preview is here, so check that out! While not related to DD, here are some pics of some mystery novels written by Robert J. Ray about his Private Investigator named "Matt Murdock". Daredevil #1 Original Art for sale! Want a case of factory fresh Daredevil #186 comics? The DAREDEVIL 507 preview is finally here, courtesy of CBR! The conclusion to "Left Hand Path" will surely reveal what it's in store for SHADOWLAND, which begins next month! The official SHADOWLAND checklist was printed in today's PREVIEWS magazine (with an accidental omission of SHADOWLAND: GHOST RIDER) and the only real change from what I've had on the site is December's DAREDEVIL #513. In total there are 31 issues! The inside foldout cover has 4 tie-ins displayed, and there is a SHADOWLAND section in the magazine. So, here it is, your SHADOWLAND Checklist! As the SHADOWLAND info has slowed down (for now) here are links and info from the week that you may have missed from my postings on Twitter and Facebook! Did you see the artwork editor Stephen Wacker sent my way? It's here! Stay up-to-date with the latest SHADOWLAND news in its section. Fictional Frontiers speaks with Andy Diggle about the Losers and DAREDEVIL here. 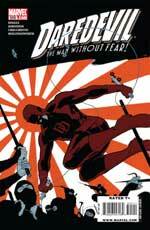 Forthcoming DAREDEVIL: BLACK & WHITE artist Jason Latour speaks about the issue on his blog. DD fan Chase March showcases his Daredevil collection. Artist Declan Shalvey shares his Daredevil sketch. DD fan Darediva sent me these custom Moleskine notebooks! It's rare I can say I have an "exclusive", but today I do... Editor Stephen Wacker sent me this artwork from issue 507, by Marco Checchetto! Enjoy! If you've seen the August solicits, you'll know that former DD & Iron Fist artist David Aja is working on DAREDEVIL: BLACK & WHITE. Yesterday on Twitter, he posted images of his art process for the cover, which definitely has a David Mazzucchelli influence! Be sure to pick up this issue in August, where Aja re-teams with Ann Nocenti for a DD tale! IN addition to the SHADOWLAND: BULLSEYE one-shot that was revealed in today's solicits (see news item below), there's now SHADOWLAND: ELEKTRA, coming in September, by Zeb Wells and Emma Rios. More details with Stephen Wacker at Marvel.com! Please remember, all SHADOWLAND updates are in the new section: SHADOWLAND section on ManWithoutFear.com. August solicits are (mostly) up and there are LOTS of SHADOWLAND tie-ins, along with some surprises. DAREDEVIL 509, SHADOWLAND 2, SHADOWLAND: MOON KNIGHT 1, SHADOWLAND: BLOOD ON THE STREETS 1, SHADOWLAND: THE DAUGHTERS OF THE SHADOW 1, SHADOWLAND: BULLSEYE 1, SHADOWLAND: POWER MAN 1, BLACK WIDOW 5, and DAREDEVIL: BLACK & WHITE 1! A warning, there are lots of SPOILERS in these solicits! Another one-shot was announced today, and it's SHADOWLAND: GHOST RIDER by Rob Williams and Clayton Crain! The SHADOWLAND tie-ins news continues, as SHADOWLAND: SPIDER-MAN, a one-shot by Dan Slott and Paulo Siqueira, comes our way in October! Here's a better look at the new Daredevil costume, as SHADOWLAND teaser #8 has been released. This will also be a variant cover to issue #1! The SHADOWLAND mini-series keep on coming, as now it's been announced that there will be a SHADOWLAND: MOON KNIGHT mini, coming in August, by Gregg Hurwitz and Bong Dazo! A new teaser was released today by Marvel... this time featuring Daredevil... but is it the Daredevil we know? THUNDERBOLTS writer Jeff Parker talks about how SHADOWLAND will tie-in to his series, coming in September. Luke Cage leads his team against The Hand! The latest SHADOWLAND mini-series has been announced and it is SHADOWLAND: THE DAUGHTERS OF THE SHADOW, a 3-issue series by Jason Henderson and Ivan Rodriguez. Black Widow writer Marjorie Liu speaks with CBR about the series so far, and what's to come in this week's issue, which features a certain DD-related guest-star! The SHADOWLAND mini-series continue, as it's been announced that SHADOWLAND: POWER MAN ships in August. The 4-issue series will be written by Fred Van Lente with art by Mahmud Asrar. But who is this Power Man? DAREDEVIL: CAGE MATCH, by Antony Johnston, Sean Chen, Sandu Florea and Matt Hollingsworth, is now available for preview (with thanks to CBR)... head on over to check out the one-shot that comes out next week! Lots of links and info from the week that you may have missed from my postings on Twitter and Facebook! Last week was all about SHADOWLAND, so I've made a new section "hub" for all info on the mini-series coming in July 2010. Check it out here! Be sure to check out the SKETCHES section for some cool additions submitted by DD fans! Over the past week, SHADOWLAND teasers have been released, which feature characters from the forthcoming mini-series by Andy Diggle and Billy Tan (coming in July!). What is also cool, is that the teasers were homages to past DAREDEVIL covers. I had been putting together a large graphic that presents the teasers alongside the DAREDEVIL covers that inspired them. Here is the final graphic with all 6 teasers that I had been updating on Twitter during the week. SHADOWLAND teaser #1 is an homage to DAREDEVIL 183. Teaser #2 is DAREDEVIL 163. Teaser #3 is DAREDEVIL 30. Teaser #4 is DAREDEVIL 182. Teasers #5 and #6 are DAREDEVIL 179. So, what do you think of the teasers? Join the thread on the MESSAGE BOARD! UPDATE: This afternoon, Marvel released ANOTHER teaser! This one doesn't look good for DD either! With the help of Ryan Lindsay, here are the homages being used for the SHADOWLAND teasers so far [Updated: #1-5 now]... check it out! DAREDEVIL editor Stephen Wacker posted some sneak peeks of pages from issue 507 by Marco Checchetto & Matt Hollingsworth and issue 508 by Roberto De La Torre, on Twitter. Here they are! The updates continue today, as Marvel.com has posted a Q&A with DAREDEVIL co-writer Antony Johnston, where he also talks about the forthcoming DAREDEVIL: CAGE MATCH one-shot. Have a read! Here's a super cool video I found with former DAREDEVIL cover artist Marko Djurdjevic, where he talks about his work while he's working on issue 500's cover! The big news for the week was SHADOWLAND and you can find all the info you need in the news items I posted over the week. Hope you guys like the changes to the site as I prepare for the SHADOWLAND goodness. Here are some of the other news items that I posted on Twitter and/or Facebook that you may have missed! Did you read the new interview with Joe Caramagna? The Welcome to the Mast blog is doing a "Daredevil Month" feature. Head on over if you're interested! Speak of the Devil episode 8 is now up! And finally, here are some intriguing logos that are definitely "DD"-inspired! DAREDEVIL colourist Matt Hollingsworth has signed exclusively for Marvel today... there's an interview with him up at Marvel.com. 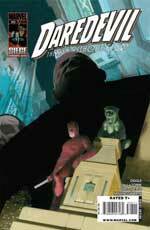 Solicits for JULY 2010 are now up on the site, including DAREDEVIL 508, SHADOWLAND #1 and BLACK WIDOW #4. A warning... if the solicits are "true", then the info is full of spoilers, so please be warned! The SHADOWLAND news continues, as editor Steve Wacker speaks with Marvel.com and reveals some more info about the mini-series coming in July! The Shadowland news continues as Andy Diggle is interviewed by IGN. Check out the video below! Here's a quick rundown of links about the forthcoming Daredevil mini-series "Shadowland" by Andy Diggle and Billy Tan, coming July 2010. Discuss all things Shadowland on the Message Board! I will use this news item for updates to stories posted this weekend about Shadowland, so be sure to keep visiting for the latest breaking news! Also, join the discussion board and talk about SHADOWLAND! As promised, here's the interview conducted by Dave Richards at CBR with Andy Diggle! The Mondo Marvel panel from C2E2 is now over, and look at all the news about Shadowland! There will be an interview with Andy Diggle up at CBR tomorrow. Diggle: I'm writing Shadowland myself, and co-writing Daredevil with my old friend Antony Johnston. I tend to be rather slow and disorganized, whereas Antony's fast and disciplined, so we complement each other pretty well. There will also be various spin-off one-shots and minis featuring characters from the series, from some top-secret creative teams Marvel won't let me reveal quite yet. LOS ANGELES, CA (April 7, 2010) -- Join the fight for truth and vengeance when Elektra: Director's Cut debuts on Blu-ray Disc May 4 from Twentieth Century Fox Home Entertainment. An ensemble cast including Golden Globe Award winner* Jennifer Garner (Juno), Academy Award nominee** Terence Stamp (Yes Man), Goran Visjnic (ER) and Kristen Prout (Kyle XY) bring the celebrated Marvel Comics storyline to life in this energetic follow-up to the 2005 film Daredevil. The Elektra: Director's Cut Blu-ray disc is packed with special features including a Commentary with Director Rob Bowman and Film Editor Kevin Stitt, the two-part making-of documentary "Relentless," The Mythology, deleted, alternate and extended scenes and more, and will be available for the suggested retail price of $29.99 U.S./$32.99 Canada. I've posted a new interview with Daredevil letterer Joe Caramagna, where we discuss what's involved with preparing a Daredevil page. Hope you guys like it, and thanks a lot to Mr. Caramagna for this opportunity. "Readers, if everything fell right on the calendar, this issue has come out on April 14, 2010. And that means in two short days, Marvel will be announcing some major Daredevil-related news at C2E2, a big convention in Chicago. So if you can't make it to the Windy City to hear the announcement firsthand, make sure and take your web browser over to MARVEL.COM on April 16 to read what all the excitement is about." Are we finally finding out about Shadowland? A new teaser today suggests... that Elektra is... an X-Man? Lots of DD-related news this week, as we prepare for the release of both Daredevil #506 by Andy Diggle, Antony Johnston, Marco Checchetto, Matt Hollingsworth and Paolo Rivera, and Black Widow #1 by Marjorie Liu and Daniel Acuna. Previews of both series are available on the site in the PREVIEWS section, as always. "Left Hand Path" continues, as Matt Murdock struggles to keep hold of his leadership of The Hand. 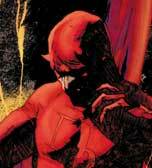 I've added lots of older Daredevil Volume 2 Previews over the past week or so. The Elektra movie will be available on Blu-ray on May 4th. More details to come! Black Widow #1 by Marjorie Liu and Daniel Acuna, ships next week, and Comics Bulletin has an early preview! The preview for next week's Daredevil #506 is now up! SPOILERS AHEAD! By Andy Diggle, Antony Johnston, Marco Checchetto, Matt Hollingsworth and Paolo Rivera. Preview courtesy of CBR! Daredevil #506 Preview on ManWithoutFear.com! As regular visitors to the site have noticed for months now: "Shadowland is coming... Summer 2010". Seems like the rest of the internet is finally noticing, as Bleeding Cool posted some theories of their own (and some incorrect information [which has been corrected]). They are saying that this month's C2E2 show will reveal more info about this storyline, though. Andy Diggle mentioned "Roberto De La Torre has just sent me what may well be the greatest page of DAREDEVIL art I have ever seen." and when asked what comic it was for, Diggle posted for "DD508", so this should alleviate some of the worries people had that De La Torre was not returning with the "In The Shadows" arc with issue 508. Darediva let me know about these really cool Daredevil cutout paper figures here and here. Here are a few of the DD-related statues, mini-busts etc. that I own... got any pics you'd like to share? Here's an album of French Daredevil Panini editions I posted to the Facebook Fan Page here. Here's a pic from a Marvel Heroes colouring book I purchased last week. 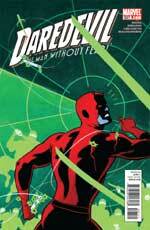 I've added about 10 new Daredevil Previews of past issues in March. I've also completed the addition of the News Archive from 1997-Present. Hope you like it! Follow me on Twitter @manwithoutfear, check out the Message Board and the Facebook fan page for all the latest DD-related news. Be sure to also visit the members of the Blog Network (see updates on the main page). CBR's Dave Richards has a new interview up with DD co-writer Antony Johnston, and there's lots of exclusive artwork for issue #506 and the forthcoming one-shot Daredevil: Cage Match! Daredevil #506, by Johnston, Andy Diggle, Marco Checchetto, Matt Hollingsworth and Paolo Rivera, ships April 14th, and Daredevil: Cage Match #1, by Johnston and Sean Chen, ships in May. As always, check the PREVIEWS section for the most up-to-date shipping dates and solicits. Marvel posted another variant cover to Black Widow #1, coming next month. I believe the debut issue by Marjorie Liu and Daniel Acuna will have 4 covers! Full solicits are now up for Daredevil #507, the conclusion to Left Hand Path, Black Widow #3 (featuring a certain guest star that will interest DD fans), a paperback version of Marvel Masterworks: Daredevil Vol.1, and The List, and a special $1 reprint of Daredevil #26 for the Marvel's Greatest Comics promotion. Bowen Designs has a new Black Widow statue coming in July! Get your order in for $175.00 US. Daredevil artist Marco Checchetto posted a small panel from next month's issue 506. It's not a lot, but hopefully enough to hold you over until April! Marvel has posted some early looks at Iron Man by Design variant covers, and the one for Daredevil 506 is posted... have a look! In all the crazy Amazon Omnibus pricing from this weekend (what, you missed it? ), one thing that revealed itself was a curious page for "Daredevil By Brian Michael Bendis & Alex Maleev Ultimate Collection Book 1 TPB (Paperback)". It will be 488 pages and be available in July. The page count suggests it will be about half the size of the first omnibus... so is Marvel reprinting all of the Bendis/Maleev run in fewer, larger TPB's? Marvel.com has posted a free digital comic detailing the history of the Black Widow, just in time for her new series, coming next month! UPDATE: In the new Cup o' Joe at CBR, there's an exclusive look at some pages from Black Widow #1, by Daniel Acuna. Really nice! Just a reminder, I've begun to add archives of all old news posts... I've been adding a page a day... I'm up to 2001 as of today. I will be posting up to 1997 shortly. Hope you guys like this look back at some of the things that were newsworthy way back when. Here are some links of interest to DD fans! * So what's your theory on Shadowland? * Want a Daredevil wallet? * Ever wonder why David Hayter's Black Widow movie was never made? Follow me on Twitter @manwithoutfear to keep up to date with all Daredevil news! Sideshow has a new updated version of their Punisher vs Daredevil Diorama. There are some subtle and not-so-subtle changes from the previous version... have a look! It retails for $199.99 US. The new "Speak of the Devil" podcast by the good folks at Legion of Dudes is now up. They plan to do a weekly show on all things Daredevil, with looks at past issues and reviews of the current issues as they come out. Have a listen! They've asked me to be on a future show (but I'm not sure if I have that big of an ego!). I will keep everyone informed of new podcasts on the front page as they are now part of the Blog Network! If you follow me on Twitter (@manwithoutfear), you'll know about these scripts that have been posted on myPDFScripts.com. I've had these for quite a number of years in printed form through various sources, but now you can read them all on their site! Daredevil editor Steve Wacker sat down with Marvel.com's Hotline to discuss all things Daredevil #505... there's lots of preview art! Next week's Daredevil 505 is now available for preview. The first part of Left Hand Path ships next week, by Diggle, Johnston, Checchetto and Hollingsworth, with cover by Rivera! Preview courtesy of CBR! As someone who liked the first Daredevil movie (and yes, I do think the director's cut is better and should have been the movie in theatres), there are, of course, elements I want to see in the new movie (if there is going to be one!). * No CGI. Real stunts, with parkour. * A real score, no rock music interludes. * A consistent tone, throughout, based on a "street-level" hero, not Spider-Man. The worst thing that happened to the first movie was Spider-Man. That movie's success had Fox trying to change DD into that movie, with added CGI and romance that wasn't needed. I still think DD would work better as a TV show. Obviously I know some behind-the-scenes things going on, so hopefully soon I can share them with you. Daredevil 505-507 artist Marco Checchetto posted a mini preview of issue 505 on his studio's blog. Left Hand Path begins this month, by Andy Diggle, Antony Johnston, Checchetto, Matt Hollingsworth and Paolo Rivera on covers. In what really is not news (since we knew it all along) Deadline Hollywood is reporting that Daredevil is officially being rebooted by Fox/New Regency with Peter Chernin producing. Onboard as writer is David Scarpa, who wrote The Day The Earth Stood Still remake and the Robert Redford movie The Last Castle. 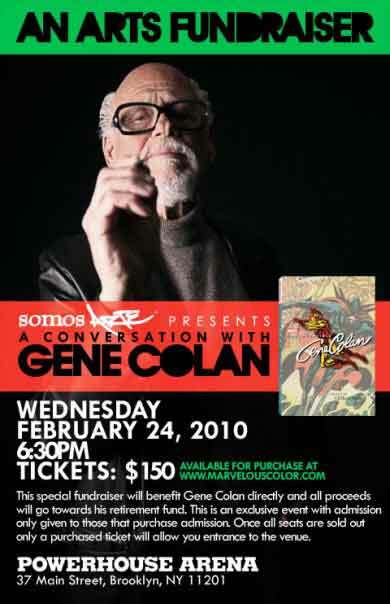 If you're in New York City, please make sure to check out a new fundraiser for Daredevil legend Gene Colan, that will be happening on February 24! Produced by the same people who brought you the Santerians exhibit, A Conversation with Gene Colan starts at 6:30PM at the Powerhouse Arena. Tickets are $150, but gets you two passes, one Colan sketch and an autographed copy of The Invincible Gene Colan! Click on the poster for more info. If you've seen the cover for Daredevil 506, head on over to artist Paolo Rivera's blog to check out his art process for creating the cover! The preview for Daredevil #504 is now available... SPOILERS ahead! Marvel is quickly making many of their titles available in digital form. Two ways you can now view or purchase Daredevil comics, is through Marvel's Digital Comics Unlimited, or Sony's PlayStation Digital Comics. If you'd like to see what issues are available, please check out the links below. Marvel's initiative costs $4.99 US/month (billed as $59.88 year) or $9.99 US/month. This gives access to all titles to view. Sony's Digital Comics can only be viewed on the PSP, and must be downloaded through the PlayStation Network. Each download ranges in cost (most seem to be $1.99 US). Please note, this is currently not available in all countries. As of this date, only Australia, Germany, Spain, France, Ireland, Italy, New Zealand, Austria, South Africa, the UK, and the US, can download. I will create a new section for digital comics very shortly and keep track of the issues available for people interested in this new way of reading Daredevil! April's Daredevil #506 solicit is now up as well as Black Widow #1... SPOILERS ahead, as "Left Hand Path" continues, by Andy Diggle, Antony Johnston, Marco Checchetto and Paolo Rivera. There will also be an "Iron Man by Design" variant by Mike Del Mundo. Good morning, and welcome to Year 14 of ManWithoutFear.com! I've been very lucky with this website and the simplest thing I can say is "thanks" to each fan and Daredevil creator who has ever taken the time to visit or write to me. If you've checked out the front page, you may notice a new addition for Year 14... namely the Blog Network. I asked Christine, Alice and Robert, of The Other Murdock Papers, Daredevil-A-Day, and The Matt Murdock Chronicles, respectively, if they would be interested in being a part of it, and they graciously accepted. Be sure to visit their blogs for their unique spins on Daredevil. You can see their latest updates on the front page. Be sure to visit later this week (hopefully) when I'll post a new interview with a major Daredevil creator. Fingers crossed. We've got a lot to look forward to this year. Trust me. Once again, thank you for allowing me to do this crazy thing called ManWithoutFear.com. Midtown Comics has posted their podcast with DD writer Andy Diggle, where he talks about DD, Shadowland, Losers, Thunderbolts and more! Just in time for the Iron Man 2 movie, Marvel is set to launch a new Black Widow ongoing series... written by Marjorie Liu and drawn by Daniel Acuna! Lots to look forward to this year, as 2010 will bring some interesting Daredevil-related comics. "End of Days" should finally be getting back on track for release. Brian Michael Bendis and David Mack are writing, with Klaus Janson, Bill Sienkiewicz, Alex Maleev and Mack as well, doing artwork. The special "Invincible Gene Colan" will be released in February, so please pick up the book to help support "The Dean". The second Brubaker/Lark omnibus is also scheduled for the Spring as well. For the web site, I hope you've enjoyed the changes and additions last year. I appreciate all the comments and emails I received. This month will be the 14th anniversary of the site! I am very happy that I had the chance to interview Shane McCarthy, Martin Redmond, Alex Irvine, Tomm Coker, and Justin F. Gabrie. I am also glad everyone enjoyed the special Fall From Grace retrospective with Dan Chichester, Scott McDaniel and Hector Collazo. It was a lot of work, but it was worth it! Sometimes this site feels like a full-time job. I wanted to say thanks to the outgoing DD creative team of Ed Brubaker, Michael Lark, Stefano Gaudiano, Chris Eliopolous, Marko Djurdjevic, Warren Simons and Alejandro Arbona. They let me help out with issue #500, and I will always be grateful for that opportunity. I also had the chance to meet Michael Lark and Marko Djurdjevic and I'm happy to say, they are top-notch people in "real life" as well. I also wanted to say thanks to the current team, who have been very supportive of my site. Yes, after all these years, it still amazes me that these guys would even care to know who I am. On a personal note, there's no news to report on my job search... but I'm staying positive.